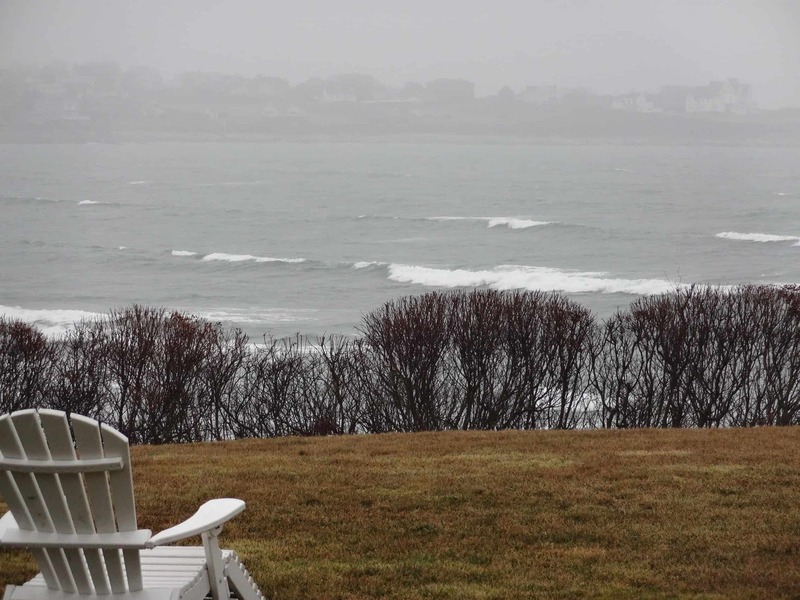 The historic island city of Newport, Rhode Island is a mere 60 miles from Cape Cod so a comfortable distance for a day trip by car if you’re having a Cape Cod vacation at our boutique inn. The city is home to the highest number of colonial buildings in the US and, most famously, to the Mansions (or summer cottages of the rich & fabulous to be more accurate! ), that were built here in the gilded age of the early 20th century by those who liked to flaunt their hard-earned bling in an architectural way. 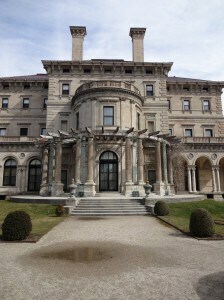 The Breakers, built by the Vanderbilts, is the most well-known and ostentatious of the mansions, with its marble walls, gold embossed ceilings, platinum (excellent choice) panels and Baccarat crystal chandeliers. 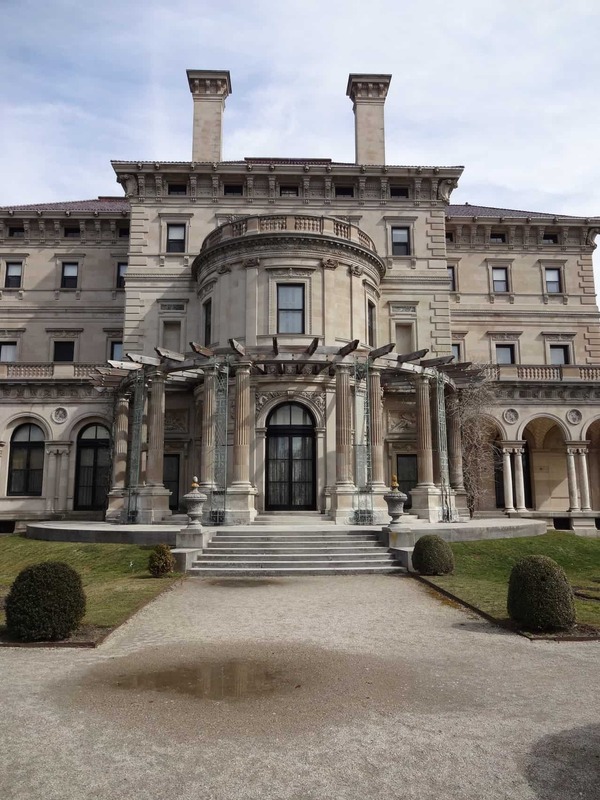 But visits to The Elms, The Marble House (another Vanderbilt bivouac), Chateau-sur-Mer, Rosecliff, Isaac Bell House, Hunter House and Kingscote are also well recommended. Although the owners of all these mansions were clearly not struggling for the odd $1m, they each insisted on shipping their one set of family silverware with them where-ever they travelled. You would have thought that it would have been a mere trifle to raid the amply stuffed kitty and splash out on a back-up set of cutlery to avoid endlessly packing up the truffle forks, bouillon spoons, gateaux knives, lobster forks, caviar spoons and camembert knives but apparently when you have a favorite knife and fork then no substitute will do. If wandering around the great Mansions and ascending and descending the many elegant staircases has not been enough to build-up your appetite, then head for the spectacular 3.5 mile cliff walk to take in the heady views, fresh air and great birdwatching opportunities. But remember to tread carefully as there are spots with deep vertical drops of 70 ft if you wander off the path! there’s no better spot than the Brick Alley Pub right in the heart of downtown Newport. For fine dining and a real treat the best recommendation is the Castle Hill Inn, which sits on its own private bluff looking out to sea. Exceptional food, great service and a stunning location. 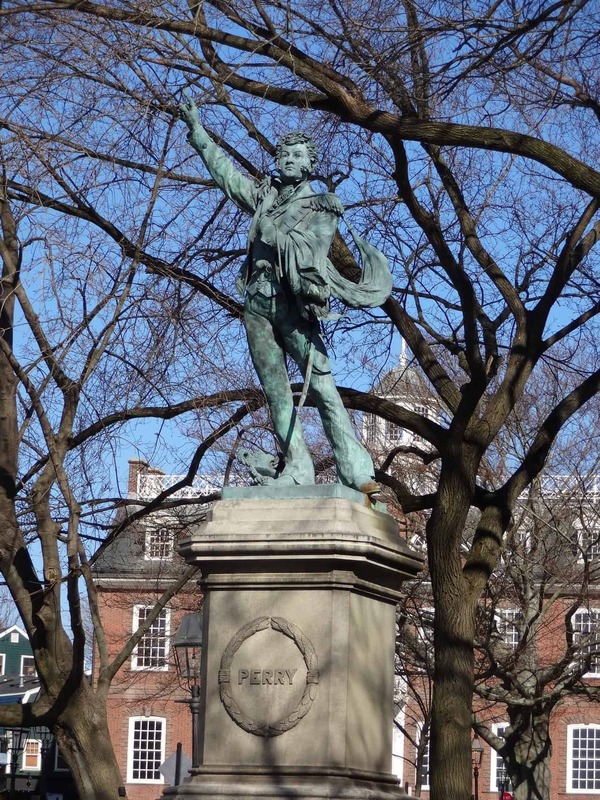 If that wasn’t enough to entice you, Newport is also home to the International Tennis Hall of Fame so I wasn’t surprised to hear that there was a statue of a man named “Perry” located close-by. 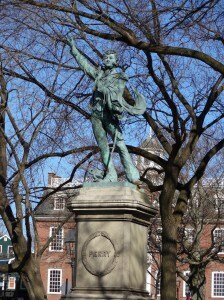 However, much to my chagrin, on finding the said statue I discovered that rather than being of that great English tennis star, Fred Perry, it was in fact the Brit-bashing US naval hero Oliver Hazard Perry. A man whose parents had originally named Oliver Danger Perry before realizing that he’d fast become a bore at parties forever announcing “Danger is my middle name” so, after consulting “thesaurus.com”, they elected for the middle name “Hazard”. It was also evident from the pose of the statue that dear Oliver had also been a subscriber to “Disco Monthly”.